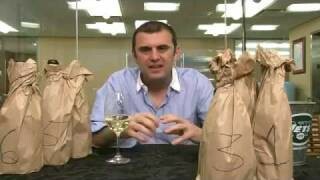 Gary Vaynerchuk is back with a blind tasting show of Chardonnay from all over the world and he makes his official Jets prediction against the Patriots. I’ll have to find that Chardonnay, my wife isn’t into them too much because the oak monsters have scared her away. This may be the one to get her into them. QOTD: I drink white wine year round especially Rieslings and Gewurztraminers. When wineries use old and new barrels for blends rather than for certain vintages, like LA CETTO Chardonnay’s case, the wines get over-the-top oaky and woody, and sometimes they feel like something is being masked with all that extra flavoring and aromas, hence the name Big-Cellar, like old European Vinters. I tried it for the first time on Sunday. Jason at Jason’s Wine Blog always seems to recommend Dr. Beckermann’s Riesling having it in his Trader Joe’s Top 10 list. I thought it was OK, but nothing earth-shattering. TJ’s has it for $5.99. I’d rather save $4 and just get the Charles Shaw Pinot Grigio which I find to be quite pleasant. Nice to see the brown bags G.
QOTD: I’m getting more & more fascinated by German Rieslings. So, I’ve been exploring those this winter. Hopefully the loss last night serves as a wake up call to the J-E-T-S, and not just to the players, but the coaches as well. Would love to see them in the Super Bowl. Keep your chin up my man. Since I’m commenting so late, I will not give a classless dig at ya for the way that my Pats slaughtered the Jets yesterday… ok i kinda just did, but I won’t say anything else because I know how devastated you must be…or should be. Well, so much for holding back. QOTD: I consistently drink a larger percentage of white over red throughout the year, but over the past few months I’ve found myself gravitating more toward the fuller-bodied, sometimes oaked whites or richer, nuttier, creamier sparklers more than anything else. of course I drink white wine in the winter! QOTD: I definitely keep drinking the whites during the cold months, but maybe move towards some of the heavier stuff, like Alsace Riesling, richer bubbly and I always drink more dessert wines during cold weather. Definitely drinking white in winter! Coming from British Columbia in western Canada, aromatics are king and I am crazy for Riesling… anytime! That and Chardonnay are diverse grapes making a wide variety of wine styles (dry, off dry, sweet, dessert, and sparkling) pairing with a lot of foods. My family prefers different styles of wines, (red, white, dessert) so I bring a tasting party!! Merry Christmas Vaynernation!!! Not to big into the whites in the winter but I will have some if others are drinking it. Also sorry about the Jets Gary they will have a nice bounce back game next week. Keep up the great work! QOTD1: I don’t drink much white in general but I happen to have an open bottle at home right now. I’m drinking about 80% white now a days. One tradition for me is to drink hot sake over winter. Rice wine is pretty white..
What about doing a brown paper bag show only on wines from new and different parts of the world, really different and unknown and see what happens. There is Morocco, Israel, Croatia, Slovenia, Mexico just to name a few. Let’s have some fun, go wild go to new regions ! Hey!! I’m drinking red and white this winter – a bit more white than I usually do as a matter of fact. The only thing I’m not really on is rosé at the moment, unless it’s pink sparkling. Loving the brown bag episodes! QOTD: I do enjoy white wine every now and again around this time, although I have to say I drink more red when it gets colder out. I just had a pinot gris from Hungary that I really enjoyed. At first came off like it was going to be a little sweeter with that “sugarfied” nose but the second day it developed this asian pear sitting in its own syrup and a really nice minerality. Also, this girl I just started seeing doesn’t drink red so I find myself keeping more white in the apartment than I normally would around this time of year. qotd: I drink white all the time yo! Hey I lived in the Santa Cruz Mountains, glad to hear there is more and more great whites coming out of California. To answer your question, yes, I love drinking white wine in winter as well as summer. Its almost like drinking it reminds me of the light and warmth of summer in the freezing NJ winter. GV – KUDOS! KUDOS to Baja! QOTD: Yes to drinking white wine in the winter and…HEY! WE will be in Detroit for Christmas, (big deal first white Christmas). White yes but also whatever is at the party… Well not quite. 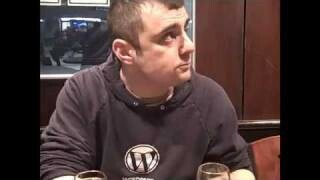 Love WLTV show, BUUUUT I wished you focus more on wines , too much time about nothing! I do love white wine in the winter, but I lean more towards the ‘heavier’ whites like an oaked Chardonnay. They can be lovely & refreshing after a day stuck inside heated buildings/home/car, and they pair well with certain meats. QOTD: Had an Oregon Pinot Gris the other day! Nice content. Love Chard! Nice curve ball K-Murph. Had to come on to hear your comments on the Chalone…will be meeting winemaker at the PGA show this weekend….now I’m off to get a bottle to give it a sniffy sniff and a swirl! im and idiot i thought it was ep 997 not 957.